The Apan Hasta Mudra is another one of the Yogic Hand Poses, which can be of great help to those aspirants striving for and kind of Satvik Mantra Siddhi. It is no secret that as the human body ages, changes start taking place in the functions of the various organs of the body. The digestion system also undergoes a change and become less effective in performing its basic function of digesting food. This gives rise to the accumulation of impurities in the stomach and intestines giving rise to stomach disorders, indigestion, gas and constipation among other ailments. This is a hindrance when one is engaged in deep meditation, especially Kundalini Awakening Mediation as the concentration suffers. The Apan Hasta Mudra or Hand Gestures is effective in reversing the declining Digestive function and restoring balance in the body. It is also known to purify, cleanse and detoxify the body of the accumulated impurities. 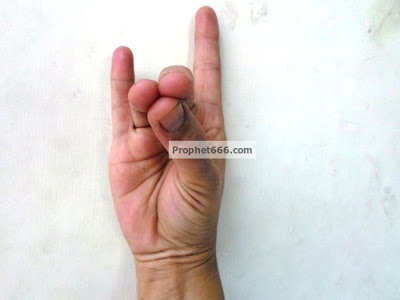 The practice of the Apan Mudra is very simple, uncomplicated and easy all that has to be done is to touch the tips of the Anamika[ Ring finger] and Madhyama[Middle finder] to the tip of the Anguta[Thumb finger] as shown in the image given below. This can be done at any time by keeping the spine straight and doing the Apan Mudra for at least 15 minutes. This balances the life force in the body and there is a noticeable change for the better in the digestion process of the body. The Apan Mudra also stimulated the lower Kundalini Chakras of the human body and benefits the practitioner by making his mind calm, composed, and free from the tensions of basic existence, which are emitted from the lower Kundalini Chakras.